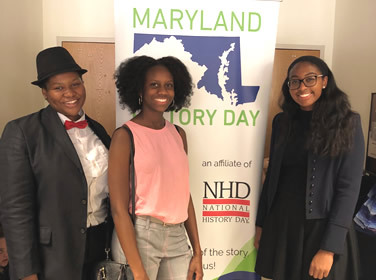 On Saturday April 28, a group of five Bullis School students traveled to University of Maryland, Baltimore County to compete in the annual Maryland History Day. There, they competed against more than 700 students from 137 schools representing 19 counties. Our students presented their research projects in a variety of formats and answered questions from a panel of judges. Quentin Brown, Senior Exhibit: "Nat Turner's Rebellion." Karynton Crawford, Senior Documentary: "A War for Peace: The Students for a Democratic Society's Conflict Against the Vietnam War." KiAnna Dorsey, Senior Documentary: "The Conflict at Hand, The Compromise at Heart." Julia Evans, Junior Performance: "Dorothea Dix: A Compromise for Mental Health." Tamia Haskins, Senior Performance: "Amos 'n Andy: Conflict, Compromise and Comedy." The students met with great success! KiAnna and Karynton advanced to the run-offs for Senior documentaries, placing in the top six in the state. 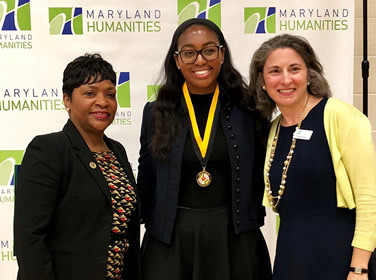 Karynton ultimately took 2nd place and will represent Bullis School and Maryland at Nationals in June. She also won a special prize: The Award for Excellence in Civic Action and Engagement. In addition, Julia advanced to the run-offs (top six) for Junior performances. Congratulations to the students and sponsoring teachers Tim Hanson, Patty Topliffe and Sara Romeyn. 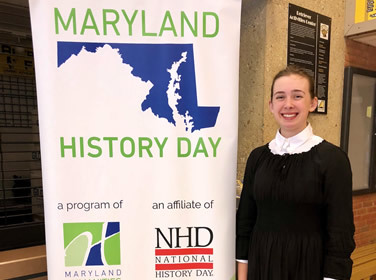 Thanks are due to Social Studies Department Chair Allison Ewing for her support and leadership and to Librarian Lisa Clarke, who provided guidance and research support to more than 280 Upper School students as well the six students in the inaugural Middle School History Day program.